We put the finishing touches on our October newsletter earlier this week and within it forwarded the following prediction regarding the debt ceiling. Well, there you have it, proof our crystal ball works! Now, if we can only get it to show us what the gold price will be in a couple years, now that Ms. Yellen (aka the Dove) can put the pedal to the QE metal and freely feed the U.S. Treasury fresh digital dollars by the billion. All kidding aside, there are some important ramifications surrounding the news. Let’s get into ‘em. With the debt ceiling raised, the Treasury can now pay the interest on its debts, thereby avoiding a default. They are also permitted to borrow more money and continue to rack up more debt to fund trillion dollar budget deficits into infinity. 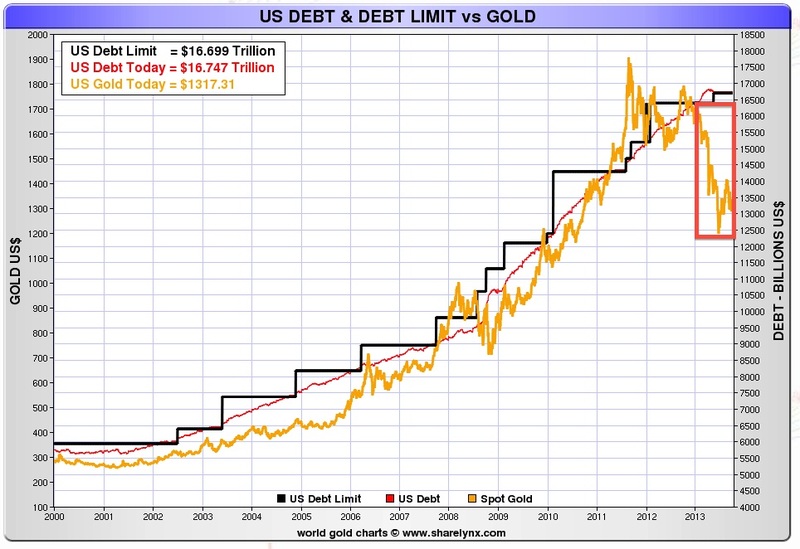 For reference, here’s a chart showing the U.S. national debt, the debt ceiling, and the gold price since 2000 (chart credit goes to Nick Laird, www.Sharelynx.com). As we commented in Ben Bernanke is Just Stringing You Along, the traditional buyers of U.S. Treasury debt, China and Japan, have significantly reduced their purchases or in some instances, completely balked at offerings. On Sept. 18th, the Fed announced that it would not taper its $85 billion QE stimulus program. It shocked the market, as a tapering announcement was supposedly a forgone conclusion. With that choice as the catalyst, the Fed’s credibility was metaphorically kicked in the groin. The decision also telegraphed the Fed’s tell, tipping off the market and revealing that it’s bluffing, and thus actually plans to keep the QE spigot wide-open, indefinitely. It may be a coincidence, but on Sept. 15th, Larry Summers withdrew his name for consideration as the next Federal Reserve Chairman, leaving only one candidate, Janet Yellen. And, as already mentioned, just 3 days later the Fed decided it would not taper. With the almost certain nod going to Ms. Yellen, who has the reputation of the quintessential dove, it seems in hindsight there may have been a good reason why the Fed decided not to taper. Perhaps it is because they already knew who the next Chair(wo)man was and therefore, knowing her affinity for stimulus, decided that it would be an inopportune time to change a Fed policy that would presumably be continued by the soon to be successor. Therefore, if this is even a little-bit true, maybe the Fed saved what little credibility it has left by not tapering. Knowing full well that when Ms. Yellen took the reins she would likely flip-flop and resume QE to infinity, resulting in even more reputational damage. The main point is, regardless of what they say, the Fed is engaged in QE for two reasons, to fund U.S. government deficits and keep interest rates, and thus interest payments, on the $16.7 trillion U.S. debt from exploding. It will achieve these two, shall we say unofficial, mandates by printing what should rationally be considered ultimately a disastrous amount of dollars. In our China To Rebuild The Great Wall With Gold article, we focused on the affect the U.S. government shutdown was having on the dollar. At that time, the dollar index had broken the psychologically important level of 80. Since the shutdown, and during the debt ceiling debate, the dollar index recovered somewhat and sat at 80.57 at the close on Wednesday, an increase of 0.71%. What was interesting was the dollar index trade after the announcement on Thursday. After digesting the big news, the market firmly decided that the dollar was not the best place to be and as a result, the index was punished and once again fell through the critical support of 80.0, to close at 79.72; a drop of over 1%. We have made reference to the inverse relationship between the dollar and gold in the past and although we concede that this relationship fits better over a long-term time frame, it was definitely in sync on Thursday as gold rallied US$37.40; or 2.9% in the face of a declining dollar. We will be keeping an eye on the dollar index as it flirts with sub-80 status. We don’t want to draw too many conclusions about one day’s trading activity. However, one could infer that the market may be realizing that the continued and likely increase of accommodative monetary policy, stimulus, QE, money printing, or whatever you want to call it, is quite simply a program to devalue the dollar. Has anyone really made it by faking it? It’s been a while since we’ve written about interest rates. The chart below provides us with some evidence as to why the Fed decided not to taper and will continue with QE. Herein lies the problem. The Fed buys Treasury bonds to fund the government and keep interest rates low on the national debt but also to stimulate the economy in hopes that it will recover and be able to stand on its own. In May, Ben Bernanke mentioned that by September the economy might improve to the point that QE could begin being tapered. The red line on the left in the chart above denotes the date of that statement. It’s what happens to interest rates to the right of that line that shows the difficult position the Fed is in. Essentially the bond market, on just the hint of QE tapering, sent rates up roughly 25%. This is what astute market observers mean why they say that the Fed is trapped. They are trapped because they must continue buying Treasuries or rates will rise and the interest payments on the monstrous national debt will become untenable. However, the Fed will not be allowed to do this in perpetuity. Sooner or later the dollars they are printing will cause meaningful inflation, but more importantly at some point the bond market will catch on to this scheme and rates will rise. So essentially, the result of the game is known. We just don’t know how much longer it will or can be played. In the meantime, take some advice from the wise Chinese. China is paying close attention to what’s transpiring in the U.S. and are not all that pleased. As their largest creditor, holding roughly $1.3 trillion in U.S. Treasuries and a total $1.7 trillion of U.S. denominated securities, you could say they have a vested interest. Granted, this may just be the opinion of the Xinhua news agency. However, last week China agreed to their second largest swap deal to date between the European Central Bank and the People’s Bank of China, swapping US$60.8 billion in euros for Chinese Yuan. And this week, the Industrial and Commercial Bank of China announced it will, for the first time, offer US$13.1 billion of Yuan-denominated Chinese Mainland stocks, bonds, and money market-instruments to London investors, starting next month. Aside from advancing the standing of their fiat currency, the Chinese have officially stated that gold is a strategic monetary asset, not just for them but for the global economy. We covered some of this last week in China to Rebuild Great Wall With Gold if you want a more in depth discussion. Google translate isn’t perfect but it doesn’t need to be to get the gist of this message! Following up on this proclamation, in the past three years the Chinese have continually increased their gold purchases. In 2011, 2012, and for just the first 8 months of 2013, China imported 372, 558, and 745 tonnes of gold respectively. China is also the largest producer of gold, and has rapidly increased production every year. In 2003, 2009, and 2012 they mined 200, 300, and 400 tonnes respectively. This year is projected to be the biggest ever, at roughly 440 tonnes (see the chart below of China’s 2013 production). 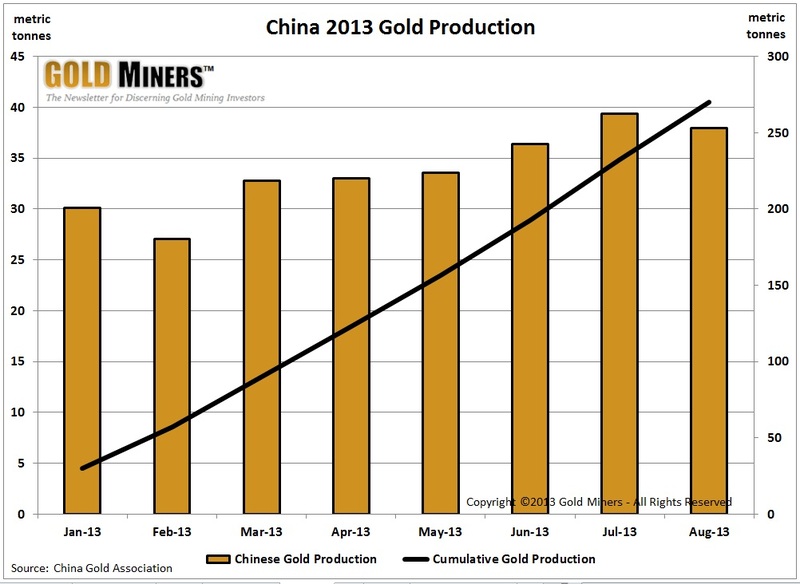 China is by far the largest gold producer in the world and their lead is growing exponentially. For comparison, of the remaining top 6 gold producing countries, consisting of Australia, the U.S., Russia, S. Africa, and Peru, none of them produced more than 250 tonnes in 2012. For further perspective, each of these other countries is experiencing production challenges that will cause output to remain flat or decline in 2013, while Chinese production continues growing. With strong fundamentals behind the gold price, the shares of selected gold miners are poised to act as strong leverage to a rising gold price. For this reason, you should check out our Comparative Analysis Table, which provides many important metrics critical to evaluating and comparing gold mining companies. Its purpose is to help discerning investors separate the wheat from the chaff.